Heroes, Heroines, and History: Lipizzan Horses and GIVEAWAY! In medieval times war horses were to knights much as our tanks and jeeps are to our soldiers today. They (the horses) were the lifeline of existence in the midst of a brutal and bloody battle. An undisciplined horse could easily get a warrior killed. Can you imagine if a knight was on his horse and when two swords clanged together the horse bolted? Those sweet docile creatures you pass while they graze in the field can become flight risks when they come upon a horse eating field mouse or a horse eating plastic bag. There fears are very real to them as horses have no defense but RUN! So in order for knights to have sound horses they needed equine military training. A war horse's training consisted of many things to develop the horses strength, balance, agility, attentiveness and willingness to work with its rider. So where am I going with all this? I'm getting to the Lipizzan horses. During the Renaissance period the Hapsburg family control Austria and Spain. There was a need for fast. light horses to use in the military and riding school. 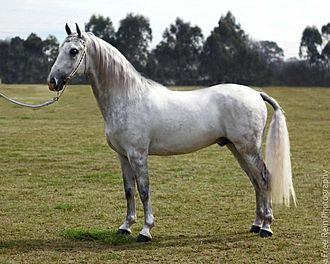 The Lipizzan breed was the genuine horse of royalty and was bred by the Hapsburg monarchy by using the Arab, Barb, and Iberian stock. The Lipizzan were used during peace times as well as war. Selective breeding over a span of four hundred years makes the Lipizzan horse one of Europe's oldest breed of horses. 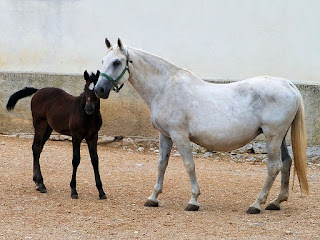 So what makes these Lipizzan horses worthy of a blog post? Seeing them in action. Today we don't need to train horses to take into battle, but what the Lipizzan horse can do is a form of art and is nothing short of beautiful. It's like watching a 1500 pound animal doing ballet. 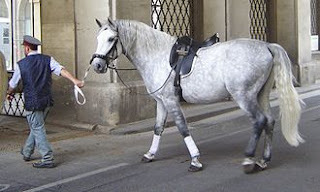 The Lipizzan is trained to preform Haute ecole dressage, airs above the ground. If you aren't familiar with horse dressage it is the highest form of horse training. The rider and the horse are expected to do certain moves all from memory. The two must be in sync for it to be the beautiful ballet of horse dances. The basic idea of dressage itself goes way back to a Greek historian and military leader by the name of Xenophon in 400 BC. War can be hard on not only people but breeds of horses. The Lipizzan horse was saved from extinction by moving them from harms way. The first war time relocation of the Lipizzan was in 1797 from Lipica. They were returned in 1807 only to be moved three more times just two years later. Then again in 1915 World War I the horses were moved. In 1942 World War II threatened these beautiful horses. Patton a horseman himself saw the animals preform and was quite impressed. He offered protection for the Lipizzan horses. Disney made a film about the Lipizzan horses and Patton in 1963 called Miracle of the White Stallions. 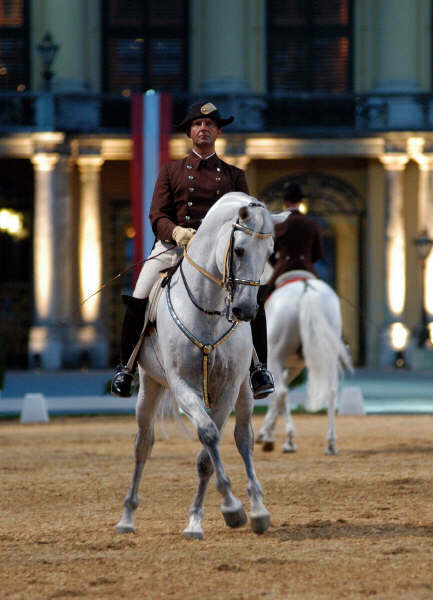 Some quick but interesting information about the Lipizzans, all their lineage can be traced back to eight stallions! Their skin is black, eyes are dark and are born black but as adults their hair becomes white while their skin remains black. 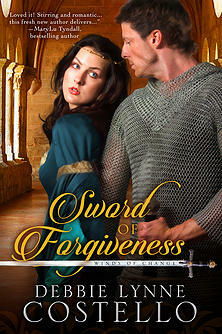 I'm giving away a copy of choice of one of Shattered Memories or my medieval, Sword of Forgiveness. Tell me if you've ever heard about the Lipizzan horses or if you've ever seen them or the movie? Or tell me about your horse. :o) Don't forget to leave your email address. Share on FB or Twitter for an extra entry. After the death of her cruel father, Brithwin is determined never again to live under the harsh rule of any man. Independent and resourceful, she longs to be left alone to manage her father's estate. But she soon discovers a woman has few choices when the king decrees she is to marry Royce, the Lord of Rosencraig. As if the unwelcome marriage isn't enough, her new husband accuses her of murdering his family, and she is faced with a challenge of either proving her innocence or facing possible execution. Royce Warwick returns home after setting down a rebellion to find his family brutally murdered. When all fingers point to his betrothed and attempts are made on his life, Royce must wade through murky waters to uncover the truth. Yet Brithwin's wise and kind nature begins to break down the walls of his heart, and he soon finds himself in a race to discover who is behind the evil plot before Brithwin is the next victim. Purchase here. NOW AVAILABLE IN AUDIO HERE ! Thank you Wiki for the great pictures! We have two beautiful fillies. Foxy is our buckskin we have raised since she was just a yearling. She is most definitely a Daddy's girl. I imagine it has something to do with the peppermints he keeps in his shirt pocket for her. Our second horse Stormy is a beautiful 23 year old bay that we recently adopted. Foxy and Stormy always seem to have their heads together as they graze. I call them our gossip girls because they seem to know what is going on in our neighborhood. Around four in the afternoon they go to the far corner of their pasture and watch the road for my husband's truck. When they see it they start walking to the barn where they know their Daddy will feed them soon. I wonder if sometimes they have him trained or at the least have him wrapped around their little....hooves. My email address is karsmidt@gmail.com. I would love to win a copy of Sword of Forgivenes or Shattered Memories. Thank you! LOL! Yes, I think that horses are much smarter than we give them credit for! Your girls sound adorable. I'd love to meet them. My one Arab we call the pasture watch dog because he is aware of everything going on! And we have a miniature donkey who is supposed to be the watch dog. LOL> Thanks so much for sharing your sweet story, Karen. Good luck in the drawing! My husband and I had the privilege of seeing the Lipizzans perform when we were overseas back in the 90's. What a performance! Those beautiful animals moved with grace and elegance. Thank you for this great giveaway. Thank you for sharing, Melanie. 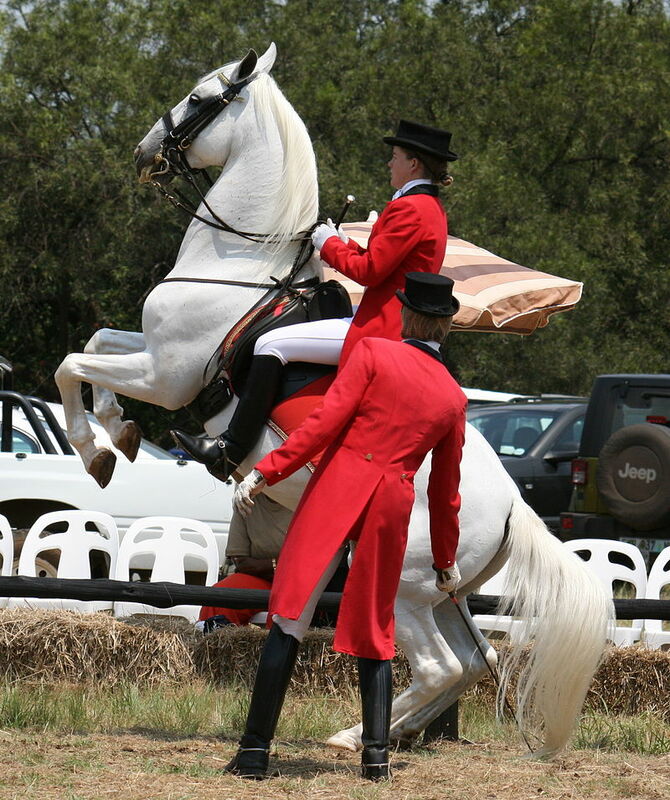 I would sooooo love to see the Lipizzans perform. I am a wee bit jealous...in a good way though. ;o) Thanks for coming by and good luck! Thanks, Connie! That means a LOT! oh my goodness! I want to see them! I bet it was just breath taking. I love to watch them on tv so I can just imagine what it is like in person! Thanks for sharing Robin. This is a fun read! I have an old book I enjoyed by E.P. Roe called The Earth Trembled that talked about the Charleston earthquake. I will definitely have to read this one! Thanks for coming by, Becky. 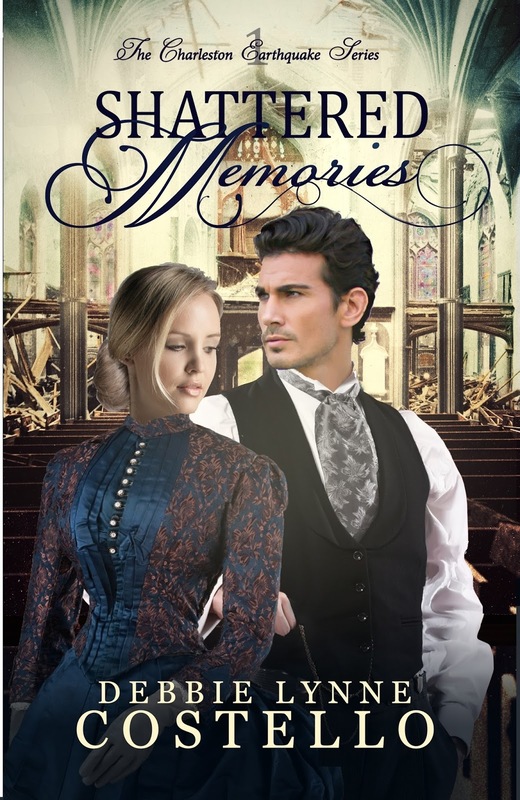 I hope you get a chance to read Shattered Memories. It was so interesting to research. Good luck! We saw The Lipizzaners once. Beautiful performance. Breathtaking! I'm googling to see when they might be in my area sometime in the near future. I would love to see them again. Thanks for sharing a bit of their history, Debbie Lynn! Thanks Pam. I will have to look them up, too. I didn't think about that! I haven't seen Lipizzaners. Growing up our family had a Shelton pony. I have close friends with horses that they use for their covered wagon adventures. The article was very informative. Thank you for sharing, Debbie. God bless as you continue to write and serve our Lord and Savior. Thank you, Marilyn. I do want God to use me in my writing. As a child I always wanted a Shetland pony but never got one. I hear they can be one stubborn animal. LOL> I'm tempted to get one for the grands though. I've been in love with Lipizzans ever since I was a kid and saw the movie about how the Lipizzan brood mares were saved from destruction during WWI. I finally got to attend a Lipizzan show several years ago. It was amazing! I am going to try and find them so we can go see a show! Miracle of the White Stallions was my introduction to these beautiful horses and I have always wished I could see them in person. Thanks, Debbie, for featuring this part of history. You're welcome, Connie! I loved writing the story. There is so much wonderful history on these beautiful animals it was hard to figure out what parts to pick! Debbbie Lynne, I was all ready to say that I've been fascinated by the Lipizzan horses since I saw a TV show about them as a youngster. Then I saw Vickie's comment and am wondering if that's the one I saw. Thanks for posting this. LOL! Thanks for sharing, Anita. I've been fascinated by these horses ever since I read a novel by Mary Stewart many years ago. They are beautiful creatures and I've always wanted to see them perform. I've read a lot about them, and enjoyed learning more through your post. Thanks. It was fun researching, Martha! I have seen videos on Lipizzan horses before. They are beautiful and their dressage is a pleasure to watch. 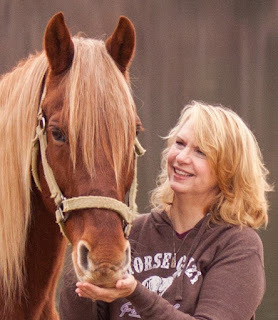 For as long as I can remember, I have always loved horses. They are such beautiful elegant creatures. Owning a horse has always been a dream, but never been a reality. Maybe someday. Thank you for telling us more about the Lipizzan breed and thank you for an opportunity to win one of your books! Hey Elise! Owning horses was our dream for many years. Don't lose sight of it if that's what you really want. It took us twenty some years but now we have 2 Arabians, 2 Tennessee Walkers, 1 Tennessee Walker colt and a miniature donkey. Dreams do come true! I've heard of the Lipizzan horses before but have never seen the movie. I think they have actually performed at the arena in Greenville in the past. Oh Wow, Patty! I would drive to Greenville to see them. What a treat that would be to be able to watch those magnificent animals preform. Very interesting article, Debbie, on wonderful horses which continue to amaze every new generation. I understand you have some Tennessee Walkers. This is my favorite horse for the smoothest ride and gentle disposition. I once bought a pregnant 18 year old registered mare in order to get one of my own. Bought the mare from Lady Major whose horse farm once compassed Covenant Baptist Church property and a lakeside housing development off Liberty Highway, Anderson. I've always told folks that comparing a TN Walker's gait to say, a quarter horse's gait, is like comparing a Cadilac to a bumpy jeep. ( : However, for great form and stamina I've always loved Arabians and one plays an important part in my current inspirational romantic suspense, Summer of Deception, which is slated for a 2017 release by Prism books. I think you would enjoy getting to know Haidez, my hero Luke's Arabian stallion which lives at Barrett Hall plantation in Charleston. Hello Linda. How sad that you had to put your Arab down. That had to be terrible. I dread the day when we face that with any of ours. The bond one makes with their horse is beautiful. But the going away party sounds so sweet. I'm glad you have found memories. Good luck in the drawing and thank you for coming by. The Lippizzan horses are so beautiful! I've loved them since I saw a movie featuring them when I was little. Someday I want to see them perform for myself. Hello Kate! I want to go too. They are the most graceful animals. It's hard to believe 1500 pounds could be so graceful! I don't remember hearing about the Lipizzan horses. They are beautiful in your pictures. I have only cats no horses. Thank you for coming by. What is so interesting about the Lipizzans is they were trained for battle like this. It was a way to thwart the enemy, the horses were so well trained. But someone saw the beauty in them and the rest is history. Hello Alison! It's amazing isn't it? And what is neat about the black skin is that it isn't as susceptible to skin cancer as the white skinned horses. Many white skinned horses end up with cancer on their skin. Good luck in the giveaway! CONGRATULATIONS Linda! You won a copy of my book. I'll be contacting you shortly!